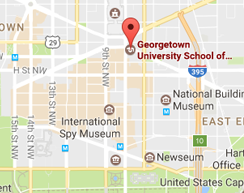 Welcome to Georgetown University and the Bachelor of Arts in Liberal Studies program. Our program provides a stimulating and challenging intellectual adventure for students, just like you, who are seeking deeper knowledge, sharper critical thinking, and improved communication skills—all prerequisites for making more significant contributions to society. The Bachelor of Arts in Liberal Studies program rests on the beliefs that all human life and human action have meaning and that people, throughout their lives, must seek it out and live by its implications. The program's liberal studies courses—which engage students in reading, reflection, writing, and discussion—are meant to bring students the range of knowledge and vision that leads to wise and rewarding lives. Specifically designed to meet the unique needs of working adults, all of the program's classes are held in the evenings and on Saturdays, enabling you to complete your degree with minimal impact on your work schedule. And because our program caters to professionals, there is no shortage of shareable life experiences and perspectives—all adding to our program's rich learning environment. We welcome you with open arms to this community of determined and impassioned learners, and in the words of Saint Ignatius, we look forward to witnessing how our rigorous curriculum challenges and inspires you to "go set the world on fire!"